Here is the newest airbrushed piece by Herman Veltorp, entitled “Lethal Dance”. The scene depicts Fw Ernst Arnold of 3/JG27 in his Bf109E mixing with with F/O Brian Carbury Spitfire of No. 603 Sqn in August 1940. Airbrush on canvas, 40 x 80 cm. 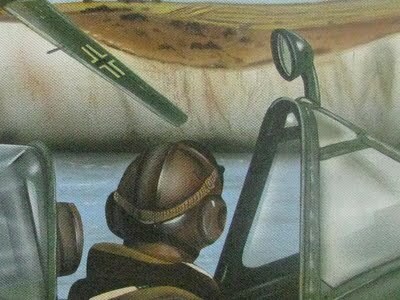 Herman Veltrop’s website is available at http://www.airbrushpower.nl/.